More of my reviews at Secrets of Lost Words.Rating: A+*cries in the corner* That ending completely broke me (in a good way)! Like, I am in shock after I read the last page. Not because of what happened in the end but because of the book general awesome-ness. I absolutely loved EVERYTHING about this book and I'm so sad to see this series go (exactly why I was crying a corner). 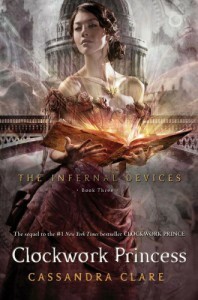 I loved everything about the Clockwork Princess though I want to point out a few things that I feel I should point out. I really liked the relationship between Jem and Will. Even though they are in a love triange with Tessa (which they don't even realize until later in the book), they have a brotherly love that makes them strong. It's not just because they were parabatai but because of their love towards each other. I also really liked Tessa. She's one of my favorite characters and she's strong heroine. I felt like she grew as a character and found exactly who and what she was. She really figured out her life.There was something that bothered me but later I grew to like it. That is the switching of perspectives. I absolutely LOATHE switching perspectives, but when done right, I adore them :) I think the switching point of views shine a light on things other than Tessa, Will and Jem. That gives us a view on other character's lives and ties everything together in the end.I also really liked the fact that this book wasn't entirely focused on the romance. it had a lot of battling scenes and training and other stuff like that. It included a lot of things (besdies the romance) like, doing something about Mortmain and his threats, curing Jem's sickness, and other character's lives.There was a few plot twists I definitely did not see coming and I was really happy about them! (Like a HELL YEAH! moment) The ending completely broke me. The epilogue was AWESOME and made me cry and sob like a baby. (I used to think I can't cry with books..) The ending was satisfying but it was a win-win? (Can't elaborate on that, sorry) I feel really sad to see this series go but it was EXACTLY the type of conclusion I wanted. Something that ended with a BANG but leaves us with our own thinking space and give us that satisfaction. I'm not good at explaining but I'm trying my best. Now I'm all like, What do I do with my life?